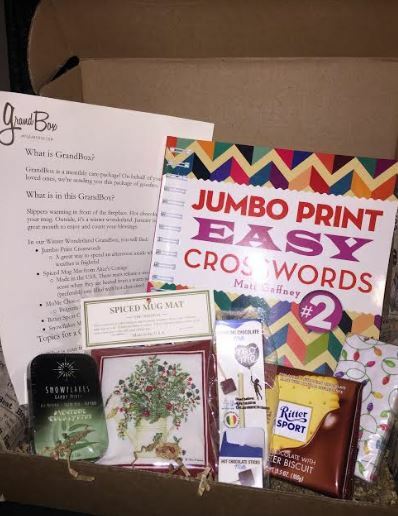 GrandBox Review by Tabitha Hanner | Grandbox Subscription Gifts for Mother's and Father's Day | $5 Savings Here! Mother's Day and Father's Day are just around the corner. Are the Grandparents hard to buy for? They are to me! Here’s a great idea! 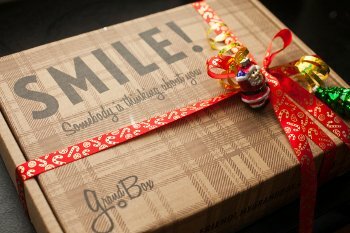 GrandBox is the perfect gift for seniors, grandparents, and older loved ones. GrandBox is the original monthly subscription box for grandparents & seniors. Whether they live down the street or across the country, it's a great holiday, birthday, and anniversary gift for your grandma, grandpa, mom, dad, aunt, and uncle. GrandBox ships near the middle of every month (except some holidays, like Mother's Day for example). Each month your loved one will get a box full of great products! Plus, you can personalize each box with photos and a note. The picture above is an example of a Grandbox. It came with a crossword puzzle book, chocolate, tissues, a spiced mug mat and more. Every box is curated for grandparents & seniors including at least 5 items reflecting a monthly theme. This was the Christmas box. Choose from monthly, 3, or 6 month recurring plans. Shipping included, cancel anytime. Order now for Mother's Day! Save $5 on your first purchase! Use coupon promo code: FAMILYGUIDE5 when you order!